 Keane’s unique unclaimed property liability mitigation programs allow us to reduce your liabilities and retain valuable assets by resolving unclaimed items before they become reportable. With unmatched experience and a team that specializes in locating and communicating with people, our programs can proactively reconnect you with your customers and investors by identifying high exposure areas within your records. Our program starts by conducting targeted unclaimed property risk management campaigns to either complete claims or demonstrate that apparent liabilities are not, in fact, eligible for escheatment. Whether you’re in need of dormant account resolution, beneficiary location, pre-audit remediation, outstanding check resolution, or need to ensure compliance after a merger or corporate action, our liability mitigation programs can ensure that your company reduces its overall risk profile and escheatable population, preserving accounts and assets in the process. We provide a detailed, account-by-account analysis that identifies valuable information about hidden fraud, escheatment compliance, and cost risks related to investor data. Provide regular program fulfillment reports to executives that demonstrate the measureable impact of our services. Keane has the knowledge, background and data management systems in place to produce impressive results and meet your operational and customer service requirements. The ultimate goal of our unclaimed property liability mitigation programs is to repair your customer relationships in a seamless manner to quickly reopen both the lines of communication and commerce. From fraud prevention and cost reduction to compliance, asset retention, and account activation, Keane has the services you need to effectively reduce your liabilities and ensure more effective data systems management.